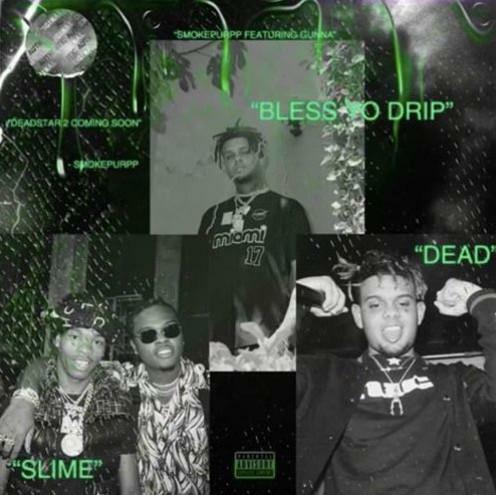 Home>New Songs>Gunna Songs> Gunna & Smokepurpp Combine Forces For "Bless Yo Drip"
Earlier this month, a collaboration between Gunna and Smokepurpp leaked, giving many an early opportunity to hear "Bless Yo Drip" for the first time. Young Gunna has been on the rise since the beginning of the year, striving through his work with Lil Baby and Young Thug. He appears to have the lasting power to stay in the game for a while. Hopefully, Gunna proves us right. Smokepurpp has received similar amounts of hype over the years, being hailed as one of the founders of "SoundCloud rap." Gunna quietly unveiled the full length version of "Bless Yo Drip" on SoundCloud, but strangely enough, it has since been reported as a leak. The official version is still pending a thumbs up the other side. The title of the track combines both of their major catchphrases, linking "Bless Yo Trap" with "Drip Season." While Smokepurpp has a large number of naysayers, he's been releasing some solid efforts as we gear up for Deadstar 2. This is another surprising effort from the young artist, who seems to be improving at an alarming rate. Gunna does his thing near the end of the track, leaving ample room for the Floridian to show off his flows at the beginning. 2019 can prove to be a big year for artists like Smokepurpp and Gunna, who both have growing fanbases at this point in their careers. What do you think or their newest joint track? UPDATE: Song has been taken down. SONGS Gunna & Smokepurpp Combine Forces For "Bless Yo Drip"